Italy is home to the some of the world’s most decadent foods – and dessert is no exception. The below list sifts through the best nooks, hole-in-the-wall dessert bars and fine dining restaurants to experience the sweet side of Roma. An Italian ice-cream, made of whole milk, sugar and egg yolks, paired with a wide range of flavours (think traditional, more than a few seasonal and even some experimental). Gelateria Del Teatro is one of three gelaterias owned by Stefano and Silvia Marcotulli in Rome, and is home to (arguably) the best gelato in the city. Featuring a delightful frontage of hanging pot plants and crates of produce visible through a glass window, and situated on a cobblestone street in true Roman fashion, this establishment is true to its heritage. This also extends to the flavours represented on the menu: including traditional cottage cheese gelato, with either sour cherries and butter crumble or almond and fig. The ‘laboratory’ out the back of their main gelateria also offers a few inventive flavours. Try the ‘white chocolate and basil’ for a surprisingly delicious combo, the ‘Amalfi lemon’ made with organic lemons from the Amalfi coast or the ‘Grandma Cream’ boasting Italian caramel pine nuts. 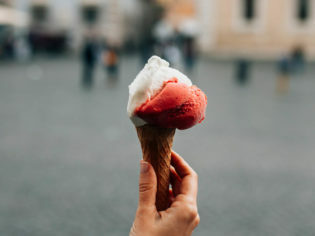 A stone’s throw from the Pantheon, and not too far from the Trevi Fountain, this gelateria is a convenient excuse to stop and reenergise before getting back into tourist mode. Italian accents adorn the interiors, with marble floors, wooden panelling and chandeliers aplenty. The main feature, however, is the gelato. Creamy, cold and creative are the best words to describe it. And with flavours like yoghurt, whisky cream, walnut and coconut there is every reason to get yourself to Giolitti (maybe on the way to the Pantheon and on the way back?). Other honourable mentions include Fatamorgana, Gelateria Fassi and the local favourite La Neviera. A classic dessert made from savoiardi, or ladyfingers – biscuits doused in coffee (and sometimes also rum) – layered with mascarpone and fresh egg custard dusted with chocolate powder. A classic Italian trattoria, Da Enzo serves a range of Italian delicacies. Try the fried artichoke and the fettuccini with pecorino cheese and pepper, but, whatever you do, save room for a tiramisu dessert. Served, simply, in a curved glass, this tiramisu is void of the superfluous flair that often attracts tourists – but boy is it delicious. Creamy and sweet, with a hit of coffee and mascarpone that begs you to take another bite. You have the option to share, but I wouldn’t suggest it. Dedicated to the Italian delicacy, this is the best place in Rome for both traditional, and quirky, tiramisu desserts. You cannot go past the original (with only a layer of hazelnuts deviating from the traditional recipe), but if you are feeling a little experimental try the pistachio-, strawberry- or rum-flavoured tiramisu. Like us, these guys are obsessed with the dessert, to the point of a new creation – the tiramisu cookie. You can eat in, at the stylish, bar-like establishment, or grab-and-go, savouring the flavour as you meander the old streets of Rome. Address: Piazza del Teatro di Pompeo 20, 00186, Rome. A crescent-shaped pastry, similar to the French croissant (but the Italians argue it’s better!). This is your one-stop-shop for the humble cornetto. With a crisp pastry exterior, and the slightly sweet, slightly chewy middle, this is the best in Rome. You can have your cornetti plain, or filled with jam, cream or Nutella – best enjoyed between sips of a cappuccino before the morning rush. Also try out the cornetti at Pasticceria Barberini, for an equally delicious breakfast. A sweet, tube-shaped, pastry filled with sweet, creamy ricotta filling. Nonna is the namesake of this restaurant and it shows. Hailing from Sicily – home of the cannoli – the owners of I Dolci Di Nonna Vincenza know how to make an authentic cannoli. Try the traditional ricotta cream filling, dipped in pistachio dust, sprinkled with icing sugar – yum! Hailed as the best cannoli joint in Rome (by the locals no less! ), Ciuri Ciuri is the destination for value, flavour and fresh pastry. The house favourite is the pistachio cream cannoli, best served with one end dipped in crushed pistachios and the other in chocolate chips (although you do get a choice of several toppings). Chocolate chip cream, mascarpone cream and chocolate hazelnut filling are other honourable mentions for an unforgettable cannoli experience in the city’s Monti district.